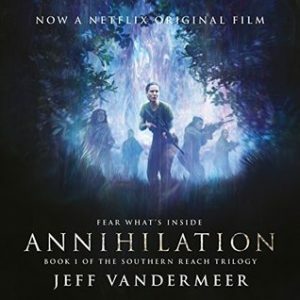 I borrowed an audio copy of Jeff VanderMeer‘s Annihilation through my local library. I really wanted to see the movie of this when it came out, but never managed it. So, I figured I’d listen to the book. I had no real idea what to expect though, as the preview for the movie was all mysterious and that’s all I had to go on. I enjoyed it. I thought the main character was pleasantly self-aware and liked that the husband was the more emotionally attuned of the two. I wouldn’t call it a romance by any stretch of the imagination, but I appreciated the little whisper of romance here and there. (That’s how I choose to interpret it.) Don’t go in looking for any firm answers though. I struggled with McCormick‘s narration in the beginning. I felt it was far too fast (and slowing it down sounded funny). However, I either got used to it or she slowed down after the first couple chapters. After that, I thought she did a fine (if somewhat flat) job of it. This entry was posted in books/book review and tagged audio book, book review, sci-fi on November 27, 2018 by Sadie.